Having one or more missing teeth can be detrimental to oral health, and self-confidence. A recent survey of people in the United Kingdom revealed that those who have missing teeth are more likely to be viewed as uneducated, lazy, or poor. A social media survey of US adults with missing teeth showed they were less likely to post pictures to social media compared with those who were not missing teeth. For patients who are fully edentulous (without teeth), traditional removable dentures have been the most popular tooth replacement option, but in recent years, dental implants have started to surpass dentures in popularity. Dental implants are composed of three parts. The first is a titanium implant post that is surgically placed below the gum line and mimics the missing tooth’s root structure. Once the post is placed, an abutment is attached that connects the implant to a tooth replacement restoration. Before the final restoration can be placed, patients should allow time for gum tissue to heal, and for the implant post to fuse with the jawbone. This process is called osseointegration and can take three to six months depending on the patient, the number of implants needed, and the level of bone density prior to placement. In the meantime, patients have a temporary prosthetic attached to the implant. Once the osseointegration process is completed, a permanent dental prosthetic is attached. Stability – denture wearers report regaining up to 70% of lost chewing ability when they switch to an implant retained denture. Convenience – dental implant supported prosthetics function like natural teeth. That means no need to remove them over night or for cleaning. Simply clean your dentures as you would your own teeth. Oral health – because implants replace the entire dental structure, not just the visible portions, patients drastically increase retention of bone and gum tissue. Dental implants are not the right option for every patient medically or personally, but advances in implant technology make it possible for us to offer many more patients the option. 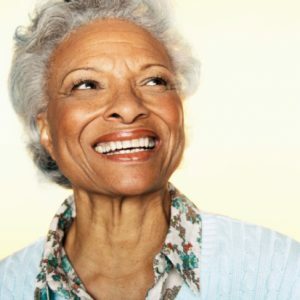 If you’re interested in finding out more about replacing your traditional denture with an implant supported prosthetic, contact the skilled team at Silver Creek Dentistry today.